Holly Daniels Christensen uses beach sand to create bracelets that remind you to cultivate good karma. A day at the beach provides time to think, pumps you up with positive energy, and can even work as reset button. Holly Daniels Christensen's beachy bracelet lets its wearer carry the good vibes of sun and surf everywhere so you can send that light and love back into the universe. Holly puts a pinch of sand gathered from your choice of one of thousands of picturesque world beachesinto a silver-plated bezel and seals it with jewelry-grade resin. Then, she places the lovely bit of beach in a band of ocean-colored beads. 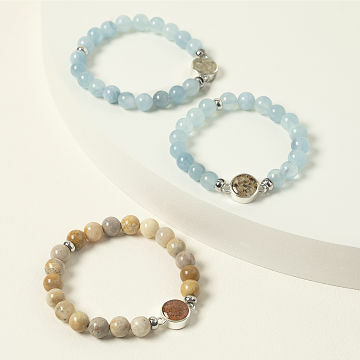 An elegant symbol of where you've been and where you're going, it's a wearable reminder to keep cultivating good karma. Handmade in Massachusetts. Take a peek at Holly's Boston area studio on our blog. Growing up on Cape Cod, and traveling to coasts across the country, Holly Daniels Christensen has become a beach connoisseur. Using the different textures and colors of the world's sands as her palette, she creates memorable jewelry that lets beach-goers prolong their vacations indefinitely. Her exquisite accessories are keepsakes more than mere decorations, and unique souvenirs for beach lovers of all ages. My granddaughters were so thrilled with their bracelets that they rushed in to the library desk of the building where we were sitting to ask for scissors to cut the bracelets from the cards and wear them immediately. Grandfather and I got extra hugs and kisses . The bracelet is very pretty, I do love it, but just wish the sand was loose in its container instead of stuck on the back of the container. Just love this bracelet. It has glass beads and is beautifully made. i love the look and the meaning behind it. I do wish it was 100% sterling silver -vs plated bezel. Though I'm hoping it doesn't tarnish! I am very impressed with this beautiful bracelet. It is sentimental (holding sand from a beach we visited on vacation) but not overly so and comes packaged nicely with information about the sand location. Beads were a prettier color than pictured. Beach sand looked good with beads. The silver work was nice. Wish beads were on a chain rather than elastic.